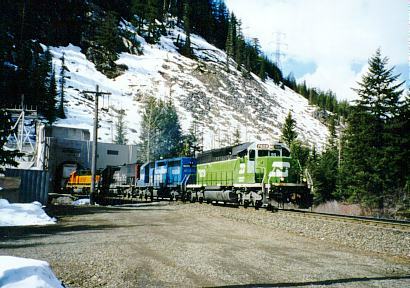 Saturday, March 28, 1998 dawned clear and sunny in the Pacific Northwest (thank YOU El Nino...), so Baolu and I decided to take a day trip following the old Great Northern mainline from Monroe, WA over Stevens Pass to Leavenworth. 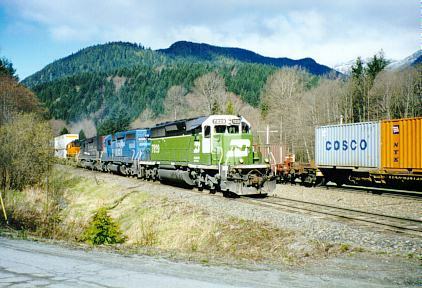 Along the way, we spotted an eastbound double stack seen here at East Skykomish meeting a westbound train. With 12 miles of 2.2% grade ahead, whiteface BN 7829 SD40-2 and company will have their work cut out for them on the pull to Scenic and the west portal of Cascade Tunnel. 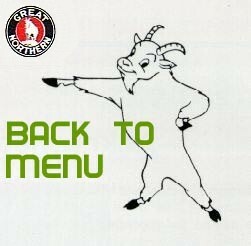 Behold the GNR and GNRHS page webmaster waiting for the eastbound to show up. Behind me you can see the newly-remodeled East Portal. The portal door is closed and giant fans are blowing air westbound over the top of the train inside the tunnel. This "tunnel flushing" makes a tremendous racket sounding like an industrial-size vacuum cleaner. A close up of the East Portal. 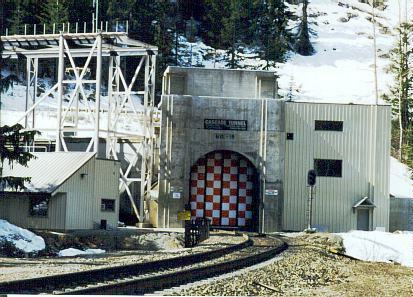 The sign above the archway reads, "Cascade Tunnel - 7.8 Miles Long - Elevation 2,881 Feet - 41,183 Feet Long - Completed 1929 - No.-15". The BNSF recently installed what looks like a "false front" which contains the red and white checkerboard reflective door. The door now opens to the right into the small building behind the signal. Originally, the door opened upward and had red and white reflective stripes. You can see the original tunnel portal looming above and behind the Cascade Tunnel sign. One of the rewards of maintaining this page is hearing from the actual employees who "make it happen". Following is the "scoop" on what the situation is actually like at East Portal. 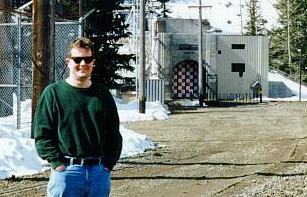 I now turn you over to Willie Jones, who is the Lead Electrician at Berne, WA on the BNSF Railroad. Willie has graciously allowed his comments to be put on the GNR Page and if you have further questions about the tunnel, Willie is the man to talk to. Thanks, Mr. Jones! "I see you were at the Fanhouse in March. The original portal door was destroyed by an eastbound freight train exiting the tunnel at Berne. All the door panels were destroyed, but there was a spare door at Delta and 36 hours later the portal door was operating again. The train ran through the door in the early morning of April 4, 1996. That door is still in place and still being used. It's located about 10 feet west of the new slider door. The galantine door is painted with red and white horizontal stripes the way it has always been. The Fanhouse now has a 2 door redundant system. If one fails the other one will take over. You might get some flack about the tunnel's length. When they built the fanhouse in 1956 they never noted the change in tunnel distance so in 1997 after the portal had been extended again we made the change to the new sign. The lettering and sign color was picked to match the sign installed in 1956. Check out an older picture of the East Portal and a photo after the 1956 fanhouse was built, you'll notice the distance is the same. The portal was extended in 1955 and 1996 for the doors. The tall concrete structure you see is the 1955-1956 extension to house the galantine door and door operating equipment. The 1996-1997 extension houses the new slider door. The reason for the tall concrete structure is the old door rises straight up and does not roll or fold up, plus it houses the pressure relief dampers." BN 7829 pulls it's consist out of the tunnel, immediately over a short trestle and past the camera. For you purists, the motive power consist is BN 7829 SD40-2 / EMD 6400 SD40-2 / SP 5380 SD40T-2 (ex-D&RGW "tunnel motor") / BNSF 3190 GP40-2. BNSF 3190 GP40-2 is resplendent in the "Pumpkin" paint scheme. 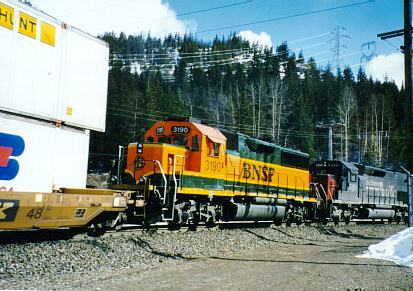 This livery combines the orange of the former Great Northern with the dark green of the former Northern Pacific (from their North Coast Limited) along with a yellow stripe. 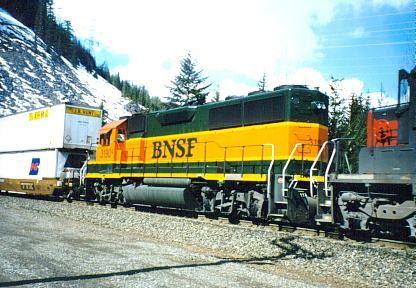 A front view of BNSF 3190. Note the roof air conditioner and the attractive BNSF logo on the low nose. The logo takes its general shape from BN's merger partner Santa Fe's emblem. 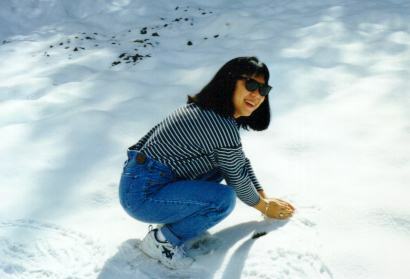 A snow bunny prepares yet another projectile to further pummel your intrepid webmaster. Baolu had fun in the snow which was still plentiful at this elevation in late March. She's not really interested in trains (except maybe for the 4449 steam engine) but was a good sport in coming along on this trip. Thanks, honey!